Forty-three out of 61 factions in the municipal councils of Imereti, which were elected in 2017, didn’t initiate any issues from the day of their registration up to November 1, 2018. Creating a faction enables the members of a municipal council to receive salaries, as membership in a municipal council is not a remunerable activity. 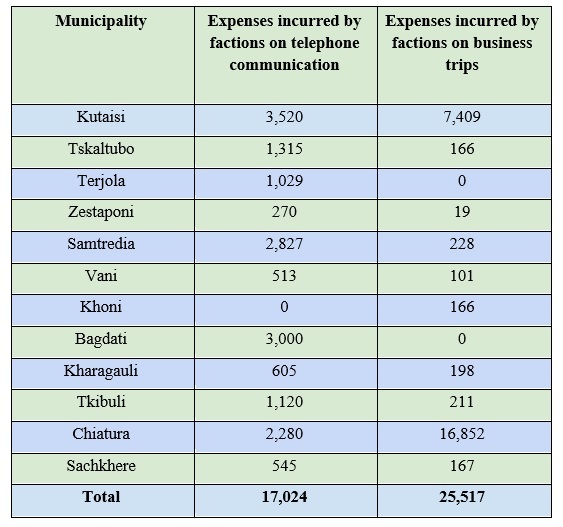 In total, more than GEL 1,800,000 was spend on the remuneration and other expenses of office holders of factions. TI Georgia has taken an interest in the number of factions functioning in the municipal councils of Imereti (elected in 2017), the issues they initiated from the time they were set up to November 1, 2018, and the amounts of money spent on the factions from the local budgets. 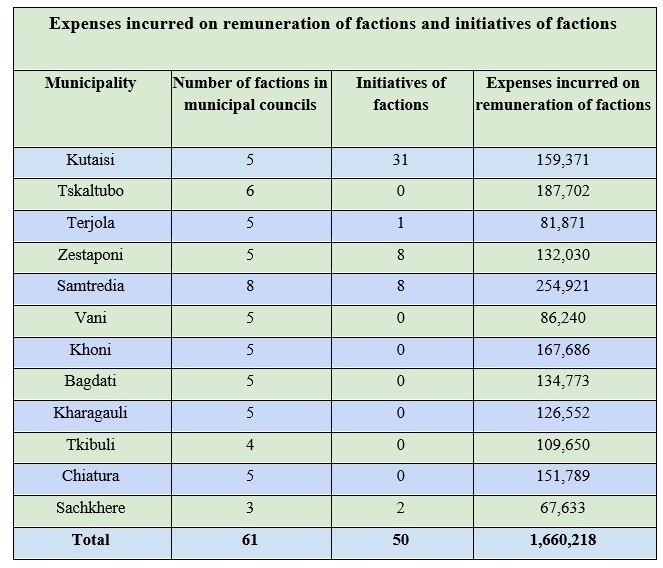 During the period studied, the municipal councils spent a total of GEL 1,660,218 on the salaries of office holders of factions (chairpersons and deputy chairpersons of factions). Four factions of the City Council of Kutaisi (the Georgian Dream, the Georgian Dream- Greens, the Georgian Dream – Entrepreneurs, the United National Movement) had the most initiatives. In particular, the initiative of the Georgian Dream faction concerned the involvement of the Mayor’s representatives in the discussion of social, economic, and political issues in administrative units; the proposals of the Georgian Dream – Greens faction concerned the arrangement of new public squares and restoration of existing ones, as well as the issues of cleaning; and the initiatives of the Georgian Dream – Entrepreneurs faction concerned the activity of commissions and factions – unfortunately, the public information provided by the City Council of Kutaisi does not indicate the concrete issues dealt with in the written proposals of the faction. The initiatives of the United National Movement faction concerned the issues of issuance of vouchers for medications and utilities, well as the issuance of vouchers to infants; paid internships for students; establishment of lower fares for students on municipal transport; allocation of funds for schools; introduction of new parking rules, etc, although the majority of the City Council didn’t accept any of these proposals. 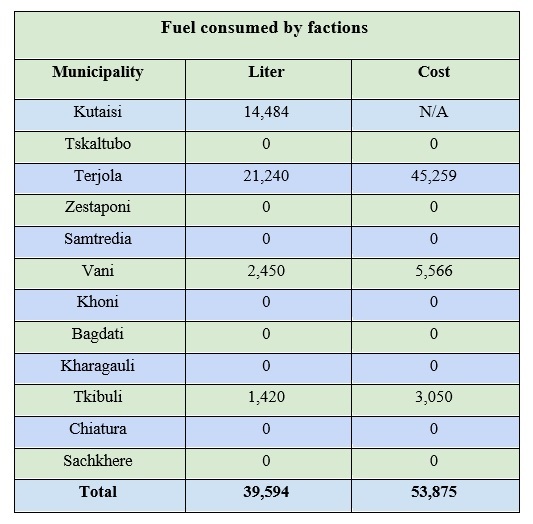 Only the municipal councils of Kutaisi, Terjola, Vani, and Tkibuli purchased fuel for factions, although, as the City Council of Kutaisi didn’t provide us with information on the cost of fuel, this data was not fully included in the present study. The applicable legislation does not provide for any upper limits on the number of factions. The procedures of creating a faction, as well as its powers and rules of operation, are determined by the statute of the faction, which, in most cases, is a general document and does not impose any types of particular obligations on the chairperson or members of the faction. Municipalities make use of the general stipulations in the legislation. All the municipal councils have created the maximum number of factions, and the expenses to be incurred on their activity constitute a considerable burden on the budgets. It should be noted that from December 2017, a new position – the deputy chairperson of the faction – was introduced, which further increased the burden of salaries. The explanatory note to the said legislative amendments indicated that this position would increase the effectiveness of the activity of factions, although, similarly to Samegrelo-Zemo Svaneti, this expectation also has not come true in the municipalities of Imereti.